I was looking through some of my books recently and kept running across great bascinets. 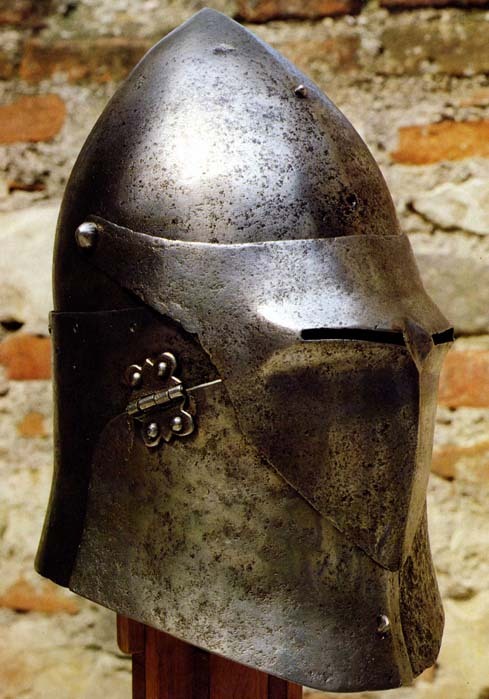 Great bascinets kind of fill the gap between the 14th century bascinet and more recognizable helmet forms of the 15th century (the sallet, armet, etc.). I don't see them as part of a clear evolution necessarily, though; the Darwinian model doesn't always hold true. I thought you guys might like to see some of these as they don't seem to get much press. Anyone have any more of these type they'd like to share? I'm also interested in more pics of the Italian one in a private collection. 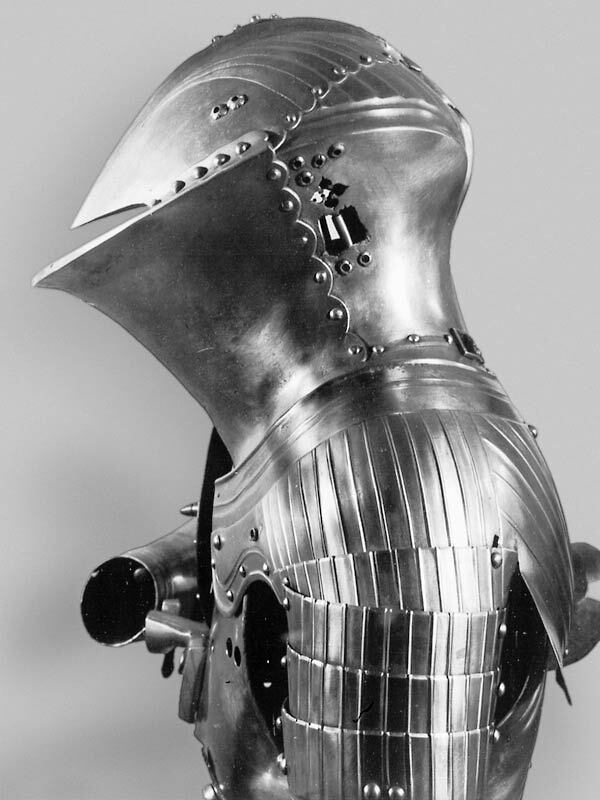 I am not that familiar with "plate armour" and the terminology. 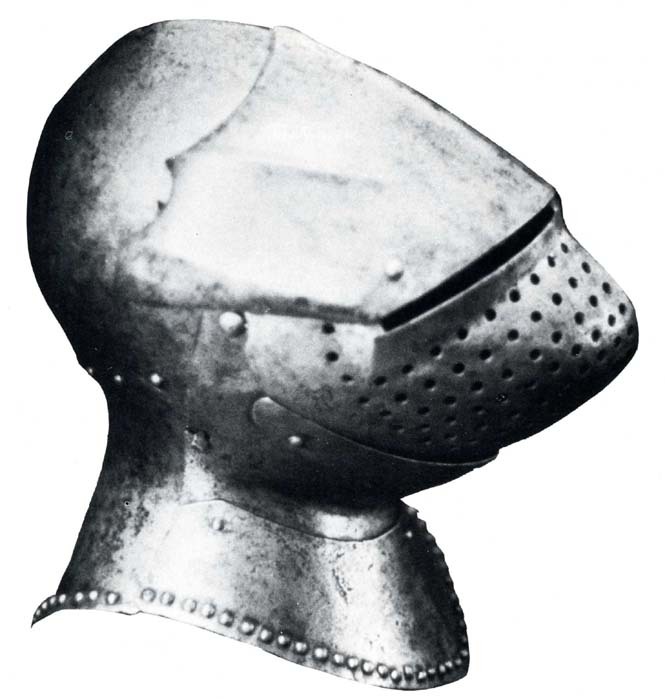 Are "frog mouth" helms and similar grouped as "great bascinets"? 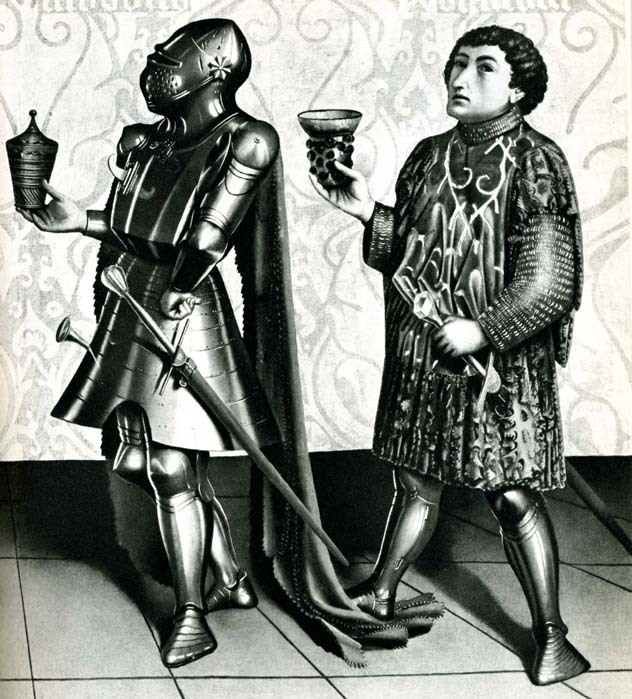 I would have guessed many of the illustrations to be specialized for tjoust. 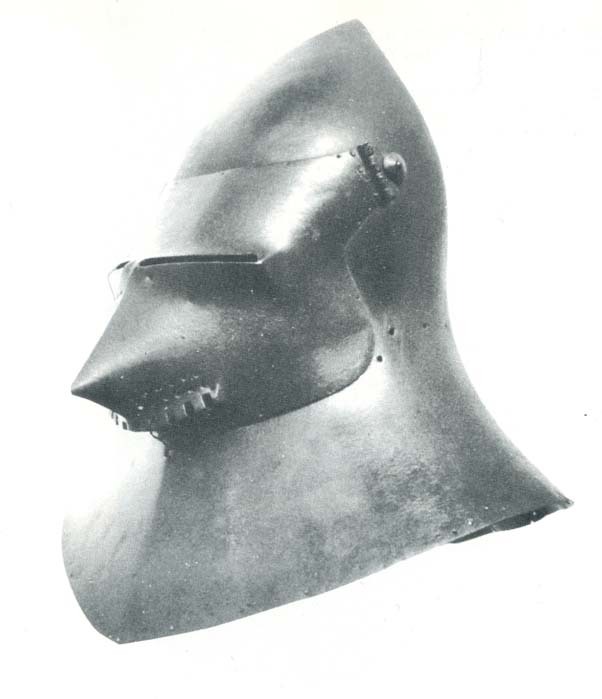 True frog-mouth helms (see below) are usually seen as an outgrowth of the great helm. 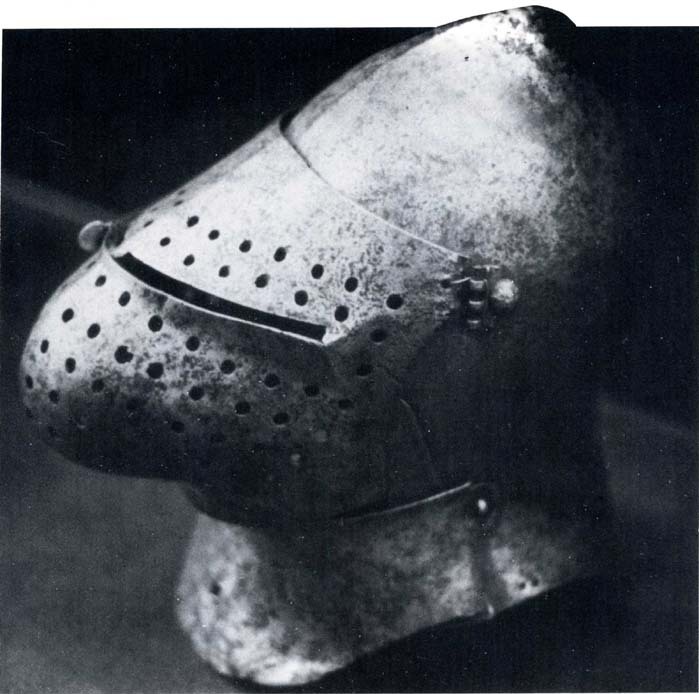 You can see great helms of the late 14th century and early 15th that are clearly trending toward that frog-mouthed shape. The one semi-frog-mouthed one in my first post (the one from Churburg) is a weird animal. It has a moveable visor which frog-mouth great helms typically don't. 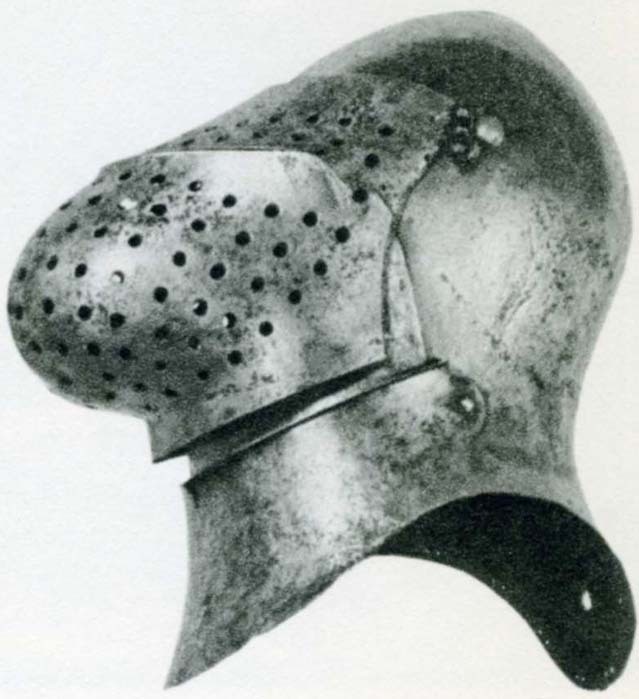 It also has a hinged bevor/chin piece like many of the other great bascinets do. But the "prow" of the helm has some of that frog-mouthed shape. True frog-mouths are seen as tilting helms. Many associate great bascinets with foot combat in a tourney setting, though I think some of the early ones saw field use as well. Great basinets were not specifically designed for the joust. 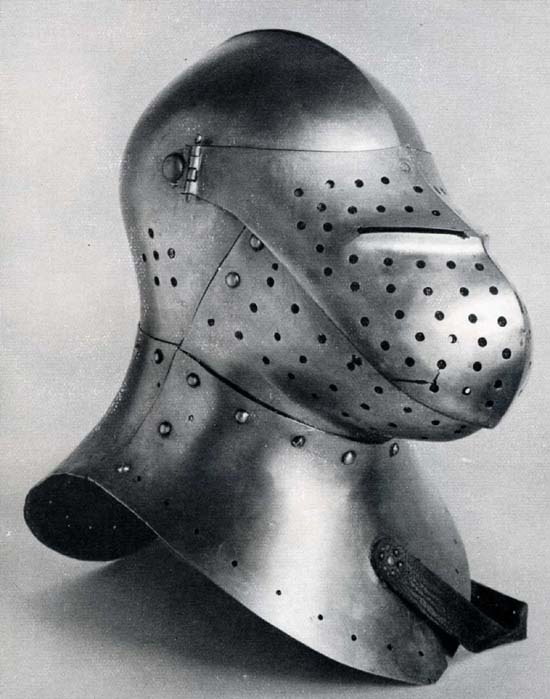 However "frog mouthed" helms were a design that appears to be specifically designed for a specific style of joust in the German states. Here are two more pics. The first is another view of the Musee de l'Armee. 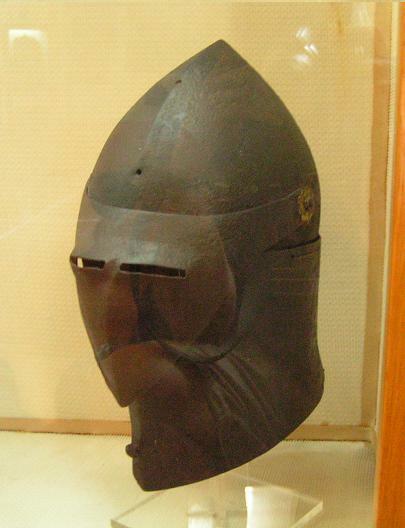 The second, also dated to c. 1400, is from the Dijon Museum. Thanks for the thread. I'd like to add some comments regarding the great bascinets discovered in the Chalcis hoard. The first image you posted is actually what I believe to be a reproduction housed in the Museum in Brescia that is based on an original discovered in Chalcis in 1840. If it is an original, it is nonetheless attributed to Chalcis as well. What I think is the original it is based upon was (and may still be) housed in Athens at the Ethnological Museum. 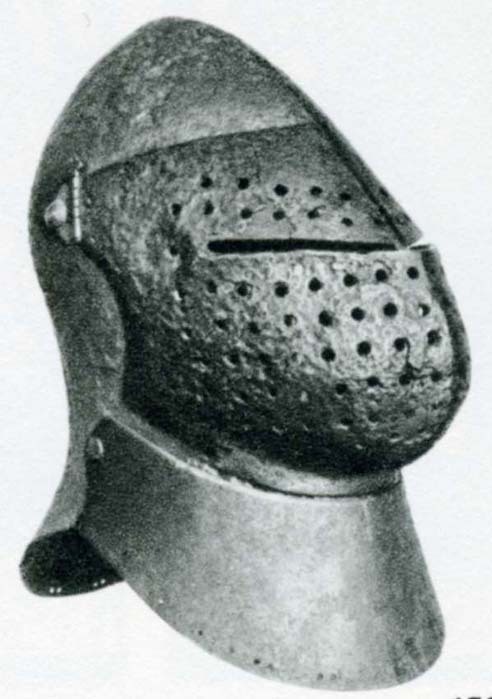 The similar great bascinet you show from the Met some photos down was also discovered at the same time in Chalcis. 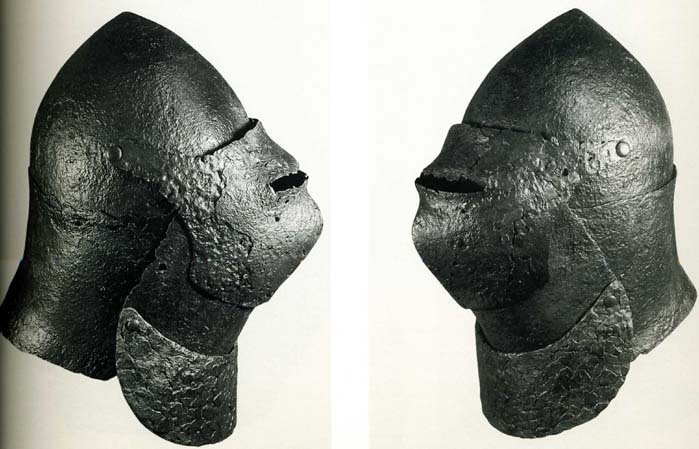 Here are photos of the original helmet in Athens and a catalog photograph from a publication about the helmets from an article about the hoard printed in 1911... 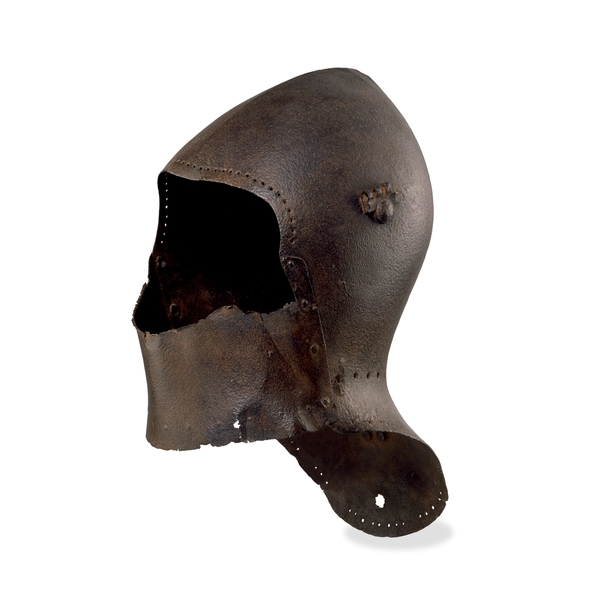 I do not believe it shows all of the helmets of this style - both of those we have better photographs of here in this thread would be hard to match to those shown in this catalog image. 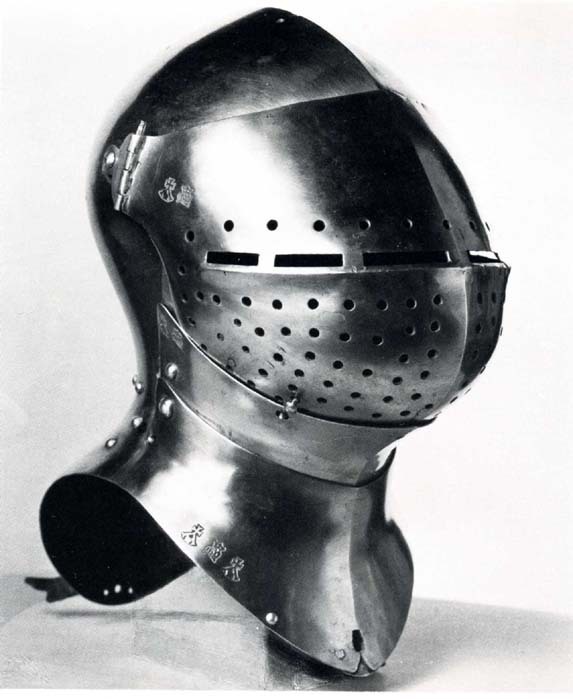 I did what research I could regarding this style of helmet from Chalcis some time ago and was unable to come up with a lot of information, despite my interest in them. For the unique features they possess, they have seen far too little publication. 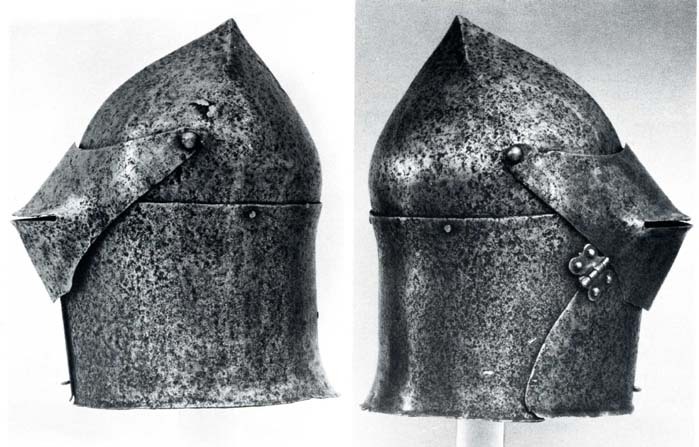 These two have actually quite a lot in common with armet - athough they have only one hinged throat protection, and are not so "head shaped" - narrow at the throat. 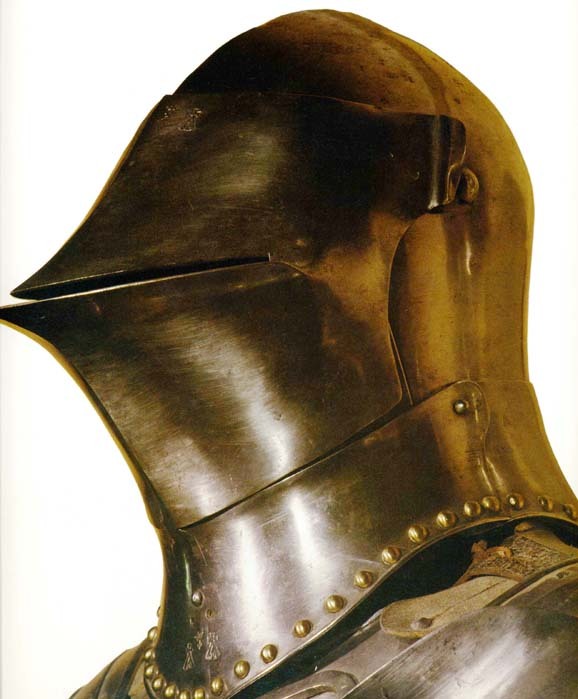 But by 1415 the armet was fully formed.